This best seller is a practical and easy to understand training manual for the modern nursing assistant. 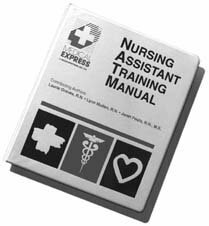 This complete and detailed training manual was written by healthcare professionals specifically for the nursing assistant involved in long-term and acute care. It is currently being used in all 50 states and includes outlined instructions for over 75 procedures. These detailed instructions are aided by illustrations, informational charts, and test sections for student practice. The notebook format allows for insertion of class notes and supplemental materials. It is also a great reference source after training is complete! Attention all Registered Dietitians, Food Service Directors and Staff Development Coordinators! DakotaTek is pleased to introduce our NEW Food Service Training Manual! Up-to-date, easy to read and comprehend, this book provides basic standardized training or inservice for food service employees. Use as a reference for current employees or as an ideal training text for new staff. Chapters are followed immediately by a short quiz to enhance the learning process. To find out if the Food Service Training Manual is the right text for you, please call and ask about our 2-week review!